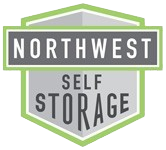 At Northwest Self Storage in Wilsonville, OR we are dedicated to providing you with the best in self storage. We offer climate controlled storage units in a clean, secure environment. Our state-of-the-art facility features a covered loading and unloading area, semi access, digital security monitoring, and on site managers. Our professional management staff will be glad to assist you — we are here to help! Whether you are moving into a new home, going away to college, or even just cleaning out the garage, Northwest Self Storage is here to help you along the way. Serving the Wilsonville area and nearby communities. SELF STORAGE IN WILSONVILLE, OR. From I-5:Take the 283 Wilsonville exit. Go west on Wilsonville road. Northwest Self Storage is 2 blocks down on the right. We are conveniently located across the street from Walgreens and Albertsons.